Nitro-Coat® is a proven process grounded by decades of research, innovative technology, and state of the art systems, designed to help plants reach their full potential. For legumes, this means a high-level of live rhizobium that will produce lots of nitrogen-producing nodules, which in turn, will create stronger, healthier plants. This is the Nitro-Coat® Advantage. Every Nitro-Coated® seed begins with the advantage of proper inoculation. Nitrogen fixation is a one of the key values found in legumes and can only occur with the proper inoculation. Although many strains or Rhizobium may be present in the soil, all are not equally beneficial. With Nitro-Coat® each seed is inoculated with the correct Rhizobium strains and coated through a proven process that ensures a very high level of successful inoculation. Nitro-Coat® is more than a coating product. It is an exclusive process to ensure consistent, effective coating. A key to any successful establishment and early seed development is moisture. Nitro-Coat® is both naturally hydrophobic and hydroscopic. The protective coating protects seeds from suddenly germinating during a brief single moisture event, while at the same time naturally absorbs water during sufficient moisture events and helps attract soil moisture to the seed for better stand establishment. Fungicides have been proven protections against diseases like root-rot and pythium. When requested and applied, Nitro-Coat® is designed to keep these valuable protectors near the seed through early seedling development. 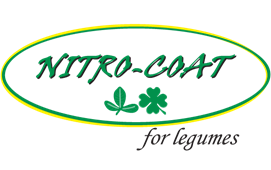 An organic version of OMRI Listed Nitro-Coat® is available for alfalfas, clovers, and legumes. Our coating has been reviewed and listed by the Organic Materials Review Institute (OMRI). For more answers to Nitro-Coat® Frequently Asked Questions, click here. What is the Nodulation Process? Do I Need to Change My Seeding Rate?